THE BEST RESOURCE for understanding any writer is his own works, and with a writer as prolific as MacDonald you will not be lacking in reading material for a very long time. For an initial taste of his diverse output, start with Rolland Hein’s anthology, The Heart of George MacDonald (1994; Regent, 2004), which includes sermons, poems, fiction, letters, and MacDonald’s two essays on imagination. C. S. Lewis’s George MacDonald: An Anthology offers an array of excerpts from MacDonald’s Unspoken Sermons, and Glenn Sadler has edited a collection of his letters, An Expression of Character (Eerdmans, 1994). MacDonald’s fantasies and fairy tales are readily available in several modern editions. For the most historically accurate picture of MacDonald, I recommend reading his novels, sermons, and other writings in their original, unabridged form.The complete set of MacDonald’s works is published by Johannesen Printing & Publishing (www.johannesen.com). Don’t overlook the collection of spoken sermons, George MacDonald in the Pulpit, edited by J. Flynn and D. Edwards (the source of the excerpt on p. 31). There is also a centenary edition of MacDonald’s novels published by Sunrise Books. Wingfold, a quarterly magazine edited by Barbara Amell, reprints rare material by and about George MacDonald (http://pages.prodigy.net/b_amell/wingfold1.html). The voluminous archives of the Marion E. Wade Center in Wheaton, IL (http://www.wheaton.edu/learnres/wade/) include books and papers relating to George MacDonald, G.K. Chesterton, C. S. Lewis, Dorothy Sayers, J. R. R. Tolkien, Owen Barfield, and Charles Williams. The center also publishesSEVEN: An Anglo—American Literary Review. Robert Trexler has produced a wonderful resource by putting the original texts of 47 of MacDonald’s books onto a single CD—Rom. Called “Ever Yours, George MacDonald,” it is available for sale at the Wade Center and on the George MacDonald website (http://www.george—macdonald.com/ever_ yours.htm). Also on this website is Trexler’s helpful overview of MacDonald scholarship to date, “George MacDonald: Merging Myth and Method,” as well as a host of other articles by various scholars, images, news, and links to resources. The standard biography is Greville MacDonald’s portrait of his father, George MacDonald and His Wife (George Allen & Unwin Ltd., 1924), with an introduction by G. K. Chesterton. More recent biographies include George MacDonald by William Raeper (Lion, 1987) and George MacDonald: Victorian Mythmaker by Rolland Hein (1993; Johannesen, 1999). Hein also teamed up with photographer Larry Fink to produce George MacDonald: Images of His World (Pasture Spring Press, 2004). See www.hsutx.edu/ academics/litlang/macdonald.html to order. For more in—depth discussion of MacDonald’s works themselves, Hein’s The Harmony Within (Sunrise Books, 1982; rev. ed. Cornerstone, 1999) and David S. Robb’s God’s Fiction (Sunrise Books, 1987) are good places to start. Those with a taste for Lewis Carroll will find much to chew on in John Docherty’s study The Literary Products of the Lewis Carroll-George MacDonald Friendship (Edwin Mellen, 1995). Though MacDonald’s fiction (especially his fantasy) has received a lot of attention from literary critics, there are few books that succesfully place him in his historical context. Notable exceptions include Stephen Prickett, who discusses MacDonald’s relation to the Romantic tradition in Romanticism and Religion (Cambridge, 1976) and Victorian Fantasy (1979; rev. ed. Baylor, 2005), and Robert Ellison, who compares MacDonald to other Victorian preachers such as Spurgeon and Newman in The Victorian Pulpit (Associated University Presses, 1998). 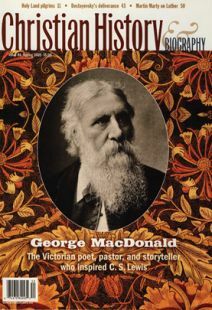 A great way to meet other MacDonald enthusiasts is to join the George MacDonald Society (http://www.macdonaldsociety.org/) Members receive an annual journal, North Wind, which includes articles related to MacDonald’s life and work, and a quarterly newsletter, Orts. The society is holding a special conference on September 16—19, 2005, to commemorate the centenary of MacDonald’s death. Taking place at Baylor University in Waco, TX, the conference will feature papers by Stephen Prickett, Rolland Hein, David Robb, and other experts on George MacDonald’s works. Finally, to learn more about the Victorian period in general, check out Timothy Larsen’s Contested Christianity: The Political and Social Contexts of Victorian Theology (Baylor University Press, 2004). Larsen also recommends The Victorian World Picture by David Newsome (Fontana Press, 1998), Evangelicalism in Modern Britain by D. W. Bebbington (Routledge, 1989), and The Intellectual Life of the British Working Classes by Jonathan Rose (Yale, 2002). Luther called us to be born again daily. Chronology of George MacDonald and related events.